At Rackspace, investigating phishing emails is just one of many issues the security team addresses. In order to manage the task, Rackspace needed a security orchestration, automation and response platform. Rackspace decided to implement Splunk Phantom. 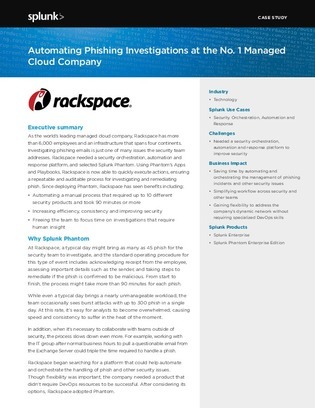 Using Phantom’s Apps and Playbooks, Rackspace is now able to quickly execute actions, ensuring a repeatable and auditable process for investigating and remediating phish.